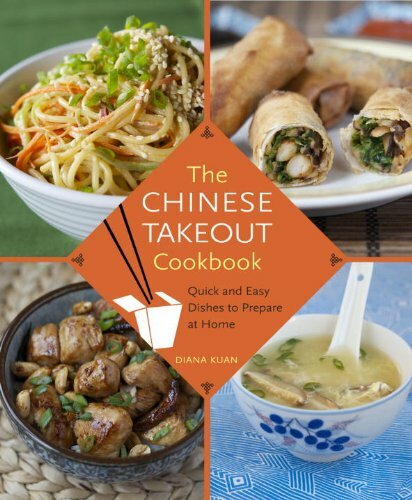 Last Wednesday was also the 1st birthday of The Chinese Takeout Cookbook! Earlier in the day, I was cleaning up around the house and found a mock-up of the original proposed cover that my publisher sent, with the working title. 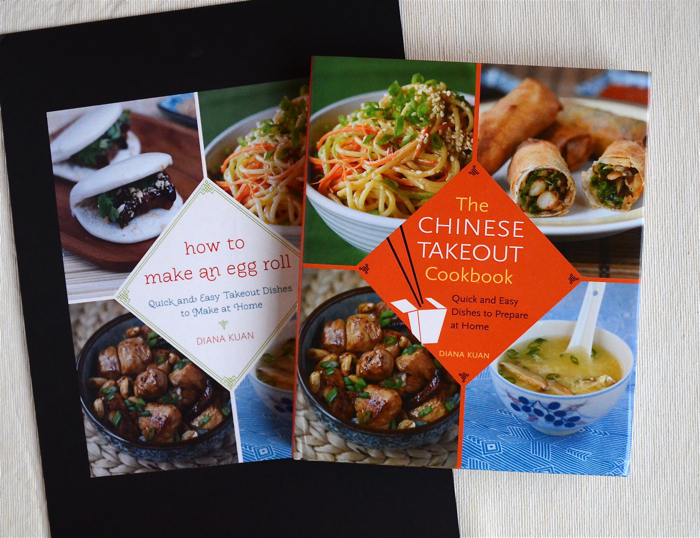 It was fun to do a side-by-side comparison of how much changed in just a few months from editing the final draft and working on the cover design to the actual publication. 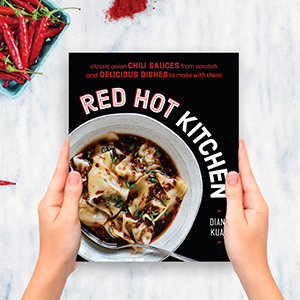 To celebrate the book's first birthday, I wanted to revive a recipe that was cut from the final manuscript because of lack of space. (I've been doing that a lot lately. Recently I taught a Sichuan class at The Brooklyn Kitchen that had a recipe for Bon Bon Chicken, a great recipe that also had to be cut. Ah nostalgia!) So, onward to rumaki, because everyone needs a good party appetizer up their sleeves during the holiday season. Just what is rumaki? And what is its link to Chinese-American food? Rumaki may be an unfamiliar appetizer these days, but it sported quite a hip reputation in the middle of last century. It first appears on the menus of tiki restaurants in San Francisco and Los Angeles in the 1940s. Trader Vic’s founder Victor Bergeron claimed it had Chinese origins, by way of Hawaii, but in actuality it was likely his own creation inspired by angels on horseback, an English pub snack of bacon-wrapped oysters. The name’s origin is also fuzzy, but possibly a take on harumaki, Japanese for pork spring roll. Whether or not the Trader created rumaki, he no doubt deserves credit for popularizing this appetizer - skewers of chicken liver and water chestnuts wrapped in crispy bacon - with the dining public. It became such a hit as a pupu platter staple that even Chinese restaurants started serving it as an appetizer. In the baby boomer era, rumaki became a fixture on the hor d’oeuvre platter of the suburban cocktail-swilling set. The dish’s entry into the mainstream is even captured in an episode of Mad Men, as Betty Draper serves rumaki to guests at her internationally-themed dinner party, though she does call it Japanese. So in short, it's really an American invention created for American diners during an era of fascination with anything that seemed remotely Polynesian and Asian. But that doesn't negate the fact that it's a delicious hors d'oeuvre. After testing it for my cookbook, I even made it for a tiki-themed supper club dinner in 2011, to much success. Now, back in the 1960s, housewives like Betty Draper would have made rumaki with bacon and chicken liver, but I like to make them with bacon and pineapple plus a few key ingredients for brushing over the top: grated ginger, soy sauce, and a little oil to get 'em golden brown and crispy. If you're looking for a festive appetizer with a dose of '60s nostalgia thrown in, try serving up a platter of these this holiday season. I definitely will when I'm back home for Christmas! Soak 16 toothpicks in a small bowl of water for 10 minutes or so. In a small bowl, whisk together the soy sauce, olive oil, honey, and grated ginger. Set aside. Slice the bacon strips in half. 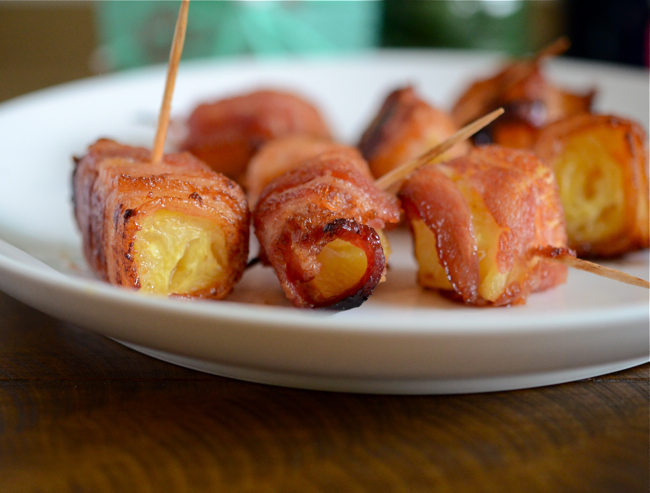 Wrap each pineapple cube with half a bacon strip, secure with a soaked toothpick, and place on a baking sheet. Brush the outside with the soy sauce and ginger mixture. Bake for 20 to 25 minutes, until the bacon is fully cooked and crispy golden brown. Remove the pan from the oven and transfer the rumaki to a plate lined with paper towels to catch any remaining bacon drippings. Transfer to a large plate and serve warm.